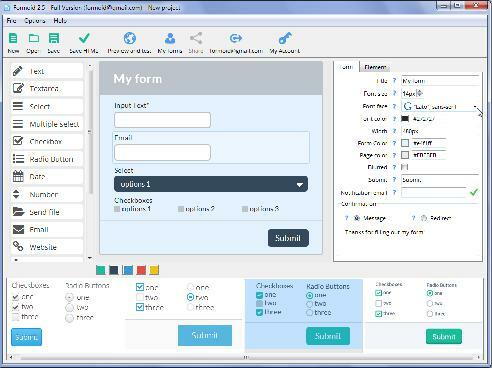 Formoid is a free desktop app that helps you easily create jquery form validation, joomla contact form, jquery forms, php email form and more in a few seconds without writing a single line of code. Create effective online forms in just a few clicks. I wanted to use this for my dealers to submit orders, but without being able to place small images next to selections, I find this rather useless. The dealer needs to see the image to find the button faster and make ordering easier. Is there the possibility of adding this image feature later? Thanks for the response. I re-read what I wrote, and it sounded very harsh. I'm sorry for that. You have a great product and I would very much like to see it come to fruition. My email's intent was only to enhance an otherwise fantastic product. Perhaps a small 150 x 150 pixel image that could be inserted next to the buttons would work. It could be the responsibility of your consumers to size accordingly. I would use Photoshop to resize. A: Unfortunately Formoid does not provide such option. You can add images as any other elements of your page next to the form fields. Hello, I have question to Formoid v2. Tried the Formoid out and looks ok.